When your child is about four to six months old, your pediatrician will probably recommended an iron supplement. This is what our pediatrician recommended when my younger son was about 5 months. However, this nutritionist mom just “happened” to have a copy of the newly published (Nov 2010) American Academy of Pediatrics age-specific recommendations for iron intake, which my doctor acknowledged she had not read yet. Healthy infants born at term have sufficient iron for their first four months. However, breastfed infants should receive 1 mg/kg of an oral iron supplement per day beginning at age 4 months and continuing until iron-rich complementary foods are introduced. Infants ages 6 months to 12 months need 11 mg of iron per day. When infants are given complementary foods, red meat and vegetables with high iron content should be introduced. If iron needs are not met by formula and complementary foods, liquid supplements can be used. Children ages 1 year to 3 years need 7 mg of iron per day, preferably from foods. Liquid supplements and chewable multivitamins also can be used. It is clear that iron-rich complementary foods are preferred over synthetic supplemental iron. But that is not what you hear in most pediatrician’s offices. Most breastfeeding moms are told to start supplementing or provide iron-fortified cereal. However, the recommendations state loud and clear that when solids are introduced, they should include iron-rich red meats and vegetables (and I would add legumes too). If you look closely though, you will see that there is a “gap” between 4-6 months when iron supplements are recommended. This is due to variations in starting solids and the assumption that breastfeeding infants have a 4-month storage of iron (down from 6 months in previous guidelines). According to these guidelines, it seems as if the AAP recommends solids at about 6 months. However, the AAP and Pediatric allergists are now saying that there is no need to delay solids and we may possibly be causing children to become allergic to food if we delay solids until after 6 months. Most experts are now recommending solids start between 4-6 months, if the baby seems interested. This is a difficult recommendation for most breastfeeding advocates, because most still recommend delaying solids so as not to deter the breastfeeding relationship. However, if you nurse first, introduce foods very slowly- mostly just to give them an introduction to food- and let the baby decide if/how much to eat, they really don’t eat much and you will still breastfeed very often. AND you will be able to provide a natural source of iron for your baby, as well as lots of practice eating! You might be wondering: “why not just give the supplements to make sure my baby is getting iron?” The recommendations make no mention of the fact that 1. Breast milk is more bioavailable (gets absorbed better) than iron supplements and 2. Infants have more stored iron if their umbilical cords were allowed to pulse for a few minutes before being cut. From a public health perspective I understand the committee would rather supplement more infants that may not need the extra iron, than deprive infants who are deficient. Especially since early cord blood clamping is so rampant and some (albeit malnourished) mothers may have low-iron content in their milk. Iron deficiency can lead to neurological impairments and possibly lead poisoning if there is a source of lead around. From a public health nutrition perspective, I understand this conundrum. However, from a personal mom perspective, I find it disturbing especially since there is some research indicates that supplementing a breastfeeding baby with iron supplements can make the breast-milk-iron less available to the baby and more available to harmful bacteria that thrive on iron. In addition, supplemental iron can interfere with zinc absorption and can diarrhea or constipation. I also have been moving away from supplements and embracing a whole-food diet, since recent research studies using supplements are failing to find they are as effective as food, and sometimes they are downright harmful. There have also been many reports of supplements containing undeclared ingredients, such as lead. I wholeheartedly advocate getting vitamins, minerals, antioxidants, fiber, and phytochemicals from food first and only supplement when it is truly necessary. So when my doctor recommended iron supplements at 5 months, I showed her the recommendations to introduce iron-rich foods. Our son seemed somewhat interested in solid food at that point and we already had one child with food allergies who we delayed solids until after 6 months, we figured we would try at 5 months this time if he seemed interested. We planned on checking his iron stores at some point between 9-12 months. On a daily basis, I offered him iron-rich animal or plant food (NOT rice cereal, which is merely fortified with iron) along with a source of vitamin C to boost absorption. I let him be our guide, allowing him to choose what was best for his body. Since he was (and is) still nursing often, I knew he would at least get the bioavailable iron from my milk. He was also lucky enough not to have his cord blood clamped at birth until it stopped pulsing, so I suspecting he had enough iron stores to get him through 6 months, instead of 4. I would nurse him before mealtime and then offer him some foods. We would offer him food once or twice a day for the first few weeks, twice a day for a few months, and eventually three times a day by 10-11 months. We never forced him to eat anything. The first month, we mashed food by hand, with a food mill, or in a small processor. By seven months, most foods were put in front of him on a tray and he was allowed to take it at his own will. So what did we offer him? Check back tomorrow for the full list! And, aren’t you curious how his iron levels fared? At 11 months we checked his iron levels and stores and they were perfect! We did it without iron supplements or iron-fortified cereals! This should not be construed as medical advice. This is a personal story. 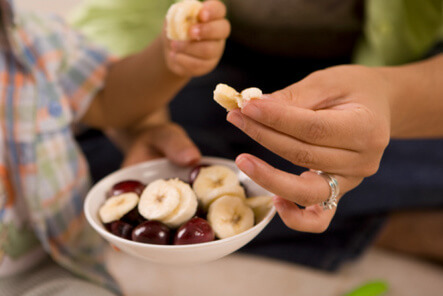 Please seek the advice of a Registered Dietitian when planning your child’s menu. Debra Waldoks is a US Registered Dietitian-Nutritionist with a Master's Degree in Public Health, and additional training in Functional Nutrition. 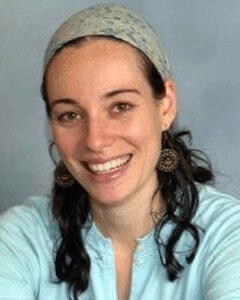 She has a private practice in Israel and New York. Her nutrition specialties include perinatal nutrition, Fertility & PCOS, pediatric nutrition, and breastfeeding.